← Dr. R.C. Sproul on Where Do Babies Go When They Die? “All vocations are intended by God to manifest His love in the world.” – Thomas Merton (Quoted in William C. Placher, ed., Callings: Twenty Centuries of Christian Wisdom on Vocation. Grand Rapids, MI: Eerdmans, 2005. 426). WALL-E has a rather lonely existence. But that changes when WALL-E meets another robot by the name of Eve. WALL-E quickly gains a fondness for his newfound friend whose name evokes a biblical image of creation. WALL-E enthusiastically pursues EVE to the point of making an unplanned journey, via spaceship, to a high-tech space station where humans who have made a real mess of planet Earth are now living a “utopian,” carefree, work-free existence. As residents of the space station, humans are waited on hand and foot by robots attending to their every whim and desire. As a result, the pampered humans have become self-indulgent, bored couch potatoes. With the passage of time, adult humans now resemble giant babies with soft faces, rounded torsos, and stubby, weak limbs—the tragic deforming and atrophying result of human beings doing nothing but cruising around on cushy, padded, reclining chairs, their eyes fixed on video screens, taking in large amounts of calories, and sipping from straws sticking out of giant cups. As human beings, we have been designed not only to rest and to play but also to work. From the very beginning of Scripture we see that the one true God is not a couch potato God, nor did he create a couch potato world. As the Genesis storyline opens, we read, “In the beginning, God created the heavens and the earth.” Here we are immediately introduced to God as a thoughtful and creative worker. At first glance we observe the triune God as an active deity. The Spirit of God is hovering over the waters. God’s infinite creativity, omnipotence, and omniscience are unleashed, and he is intimately engaged in his good creation. As God’s work of creation unfolds, humankind—the crown of creation—emerges on the literary landscape. God the Creator places a distinguishing stamp of uniqueness on human beings, one that sets humanity apart from the rest of creation. Then God said, “Let us make man in our image, after our likeness. And let them have dominion over the fish of the sea and over the birds of the heavens and over the livestock and over every creeping thing that creeps on the earth.” So God created man in his own image, in the image of God he created him; male and female he created them. And God blessed them. And God said to them, “Be fruitful and multiply and fill the earth and subdue it, and have dominion over the fish of the sea and over the birds of the heavens and over every living thing that moves on the earth” (Gen. 1:26–28). The Genesis writer wants us to grasp the unique place of human beings in creation. We observe this uniqueness in two foundational ways. First, humans are designed by God to exercise proper dominion over creation, which is a divinely delegated stewardship role. Second, humans are designed by God to be his image-bearers, to uniquely reflect who God is to his good world. The repeated use of the word image by the Genesis writer tells us of the importance of this concept for our understanding of what it means to be human. I am not in any way suggesting that we are somehow little gods or that we will ever be God, but as human beings we were created to reflect our heavenly Father. In a sense we were created to be his spitting image. We were created to worship God and to display a glimpse of God’s glory to a vast and expanding universe. This glimpse of God’s glory reveals many things about the character and magnificence of the one true God, and at a very foundational level, we must recognize our image-bearing reveals that God is a creator, a worker. God is not some cosmic do-nothing deity. While While commuting to my office, on more than one occasion I have seen a bumper sticker that provides one answer to this question of why we work: “I owe, I owe, it’s off to work I go.” Paying the many bills that come to us each month is no small matter. We can all give testimony to the high cost of modern-day living, but is economic transaction the foundational reason why we work? Scripture tells us that the most bedrock answer to the question of why we work is that we were created with work in mind. Being made in God’s image, we have been designed to work, to be fellow workers with God. To be an image-bearer is to be a worker. In our work we are to show off God’s excellence, creativity, and glory to the world. We work because we bear the image of One who works. This is why the apostle Paul writes to a group of first-century followers of Jesus who have embraced the gospel, “If anyone is not willing to work, let him not eat” (2 Thess. 3:10). At first blush, Paul’s rather blunt words seem cold and lacking Christian compassion, but upon further theological reflection, Paul’s words convey to us some needed insight. Paul does not rebuke those who, for various legitimate reasons, cannot work, but he does say that an unwillingness to work is no trivial thing. For anyone to refuse to work is a fundamental violation of God’s creation design for humankind. When we grasp what God intended for his image-bearers, it is not surprising that throughout the book of Proverbs the wise are praised for their diligence and the foolish are rebuked for their laziness. When we hear the word fool, we often think of someone who is mentally deficient. However, a foolish person in Scripture is not necessarily one who lacks intelligence but rather one who lives as if God does not exist. The psalmist puts it this way: “The fool says in his heart, ‘There is no God’ ” (Ps. 14:1). A fool is one who rejects not only the Creator but also creation design, including the design to work. Throughout Scripture slothfulness is rightly viewed in a negative light. A slothful Christian is a contradiction in terms. We should not be shocked to see that the Christian church throughout history has reflected negative sentiments about slothfulness. Sloth finds a prominent place in Pope Gregory the Great’s listing of the seven deadly sins. The Protestant Reformers spoke of the poverty of slothfulness and laziness. Consistently they made the connection that those who spend their time in idleness and ease should rightly doubt the sincerity of their Christian commitment. God could have placed Adam and Eve in the garden of Eden and made it much like the world of humans in WALL-E, where they could sit around with food coming to them, sipping their life-giving nutrients out of giant cups. This was not God’s desire or his design for his good world. Because God himself is a worker, and because we are his image-bearers, we were designed to reflect who God is in, through, and by our work. The work we are called to do every day is an important part of our image-bearing nature and stewardship. As human beings we were created to do things. In this sense we are not only human beings, we are also human doings. We have been created to contribute to God’s good world. First and foremost, work is not about economic exchange, financial remuneration, or a pathway to the American Dream, but about God-honoring human creativity and contribution. Our work, whatever it is, whether we are paid for it, is our specific human contribution to God’s ongoing creation and to the common good. Work is an integral aspect of being human, an essential aspect of loving God and his created world, and a vital part of loving our neighbor as ourselves. Gilbert Meilaender presses into the rich implications of the truths presented to us in the Genesis account. He writes, “To regard work as a calling is to suggest that we live to work, that our work is of central significance for our person. Still more, the calling gives to work a religious significance which it is not likely to acquire in any other way” (Quoted in Mark R. Schwehn and Dorothy C. Bass, eds., Leading Lives That Matter. Grand Rapids, MI: Eerdmans, 2006. 237). For us to view work outside a theological framework is to inevitably devalue both work and the worker. The creation account recorded for us in Genesis 2 emphasizes God’s design for humanity and the significant contribution the crown of creation is to make in his good world. Prior to God forming man from the dust of the earth and breathing life into him, before sin entered the world, the Genesis writer raises a tension regarding the incompleteness of God’s creation. In Genesis chapter 2:5 we read that “there was no man to work the ground.” In other words, God created humans not only to worship him and to delight in him, but to make an important ongoing contribution to his creation. From Genesis 2 we see that the earth itself was created in order to be cultivated and shaped by humankind. Unspoiled pristine nature is not necessarily a preferred state. God desired that there would be harmonious human cooperation within the creation order. Not only would the crown of creation have joyful intimacy with their Creator, but they would also be given the joyful privilege of contributing to the work of God in his good world. As Genesis chapter 2 continues, we get a further picture of a human being as a worker. We observe work as it was originally designed to be, before sin and death entered the world. In Genesis 2:15 we read these words, “The LORD God took the man and put him in the garden of Eden to work it and keep it.” The Lord God takes the initiative and places humankind in the garden of Eden with a particular task in mind. The emphasis here is not about personal human choice but rather divine initiative and divine calling. Already in Genesis we see that vocation is not something we ultimately choose for ourselves; it is something to which God calls us. Contrary to much of our present cultural emphasis that deifies personal choice, a biblical worldview begins not with human choice, but with a good and sovereign God who is not only the Creator but also the Caller. Here in the Genesis narrative, before humanity’s fall into sin and resulting corruption of the world and our work, we are given two bedrock truths regarding human work and vocation: we were created with an important stewardship in mind, to cultivate creation and to keep it; and we are commissioned by God to nurture, care for, and protect his creation. describes cultivators as “people who tend and nourish what is best in human culture, who do the hard and painstaking work to preserve the best of what people before us have done.” Creators, he says, are “people who dare to think and do something that has never been thought or done before, something that makes the world more welcoming and thrilling and beautiful” (Quoted in Gideon Strauss, “Making It New: Andy Crouch Proposes a Different Way for Christians to Engage Culture” Books & Culture, September–October 2008). Andy Crouch makes an important point. Humanity’s creative work is varied, broad and far reaching. We not only make things or fix things, but also we are actively involved in creating and cultivating human culture itself. The language of work as cultivation and creation in Genesis 2:15 is embedded in the Hebrew word avodah, which is behind the English translation “to cultivate.” The Hebrew word avodah is translated in various ways in the Old Testament. It is rendered as “work,” “service,” or “craftsmanship” in many instances, yet other times it is translated as “worship.” Avodah is used to describe the back-breaking hard work of God’s covenant people making bricks as slaves in Egypt (Ex. 1:14), the artisans building the tabernacle (Ex. 35:24), and the fine craftsmanship of linen workers (1 Chron. 4:21). Avodah also appears in the context of Solomon dedicating the temple. Solomon employs this word as he instructs the priests and Levites regarding their service in leading corporate worship and praise of the one true God (2 Chron. 8:14). Whether it is making bricks, crafting fine linen, or leading others in corporate praise and worship, the Old Testament writers present a seamless understanding of work and worship. Though there are distinct nuances to avodah, a common thread of meaning emerges where work, worship, and service are inextricably linked and intricately connected. The various usages of this Hebrew word found first in Genesis 2:15 tell us that God’s original design and desire is that our work and our worship would be a seamless way of living. Properly understood, our work is to be thoughtfully woven into the integral fabric of Christian vocation, for God designed and intended our work, our vocational calling, to be an act of God-honoring worship. One of our favorite family vacations was visiting England. Touring beautiful Westminster Abbey and Christopher Wren’s truly breathtaking St. Paul’s Cathedral was one of my personal highlights. As I walked through these beautiful and inspiring architectural works of art, I was reminded of the apocryphal story of the three stone masons who were engaged in conversation by a visitor. “What are you doing?” the visitor asked the first mason. “I am cutting stone,” the mason replied. A second mason chimed in, “I’m making a living.” “And how about you?” the visitor asked the third mason. “Me, I’m building a cathedral for God and his people.” What a difference our perspective on work makes! Doing our work before an Audience of One changes what we do and how we do it. Living with this mind-set helps us connect our faith with our work, for we live before the same Audience on Monday at work as we do on Sunday at worship. Dorothy Sayers, a contemporary of C. S. Lewis, gave a lot of thought to how followers of Christ who have embraced the gospel ought to see their work. She also spoke in a compelling way about how the church has so often dropped the ball when it comes to connecting our Sunday faith with Monday work. In a thoughtful essay simply titled “Why Work?” Sayers writes, “The Church’s approach to an intelligent carpenter is usually confined to [moral instruction and church attendance]. What the Church should be telling him is this: that the very first demand that his religion makes upon him is that he should make good tables. . . .” (Dorothy Sayers, “Why Work?” in Mark R. Schwehn and Dorothy C. Bass, eds., Leading Lives That Matter: What We Should Do and Who We Should Be. Grand Rapids, MI: Eerdmans, 2006, 195). Dorothy Sayers is not saying that offering moral instruction and inspiring worship services is unimportant. Clearly this is an important stewardship of any gospel preaching and Christ-honoring local church. But what we must not miss in her insightful words is the importance of the church in teaching each one of us that our work, whatever it is, is to be an act of worship. With remarkable insight Sayers continues, “Let the church remember this: that every maker and worker is called to serve God in his profession or trade—not outside it. . . . The only Christian work is good work well done” (Ibid). So often we use the language of Christian work to refer exclusively to ecclesiastical, missionary, or parachurch callings, but this distorted understanding exposes our inadequate grasp of the transforming truths of Christian vocation. It is hard to imagine how our understanding of work and the quality of our work would change if we would truly live before an Audience of One and fully embrace the truth that the only Christian work is good work well done. Dorothy Sayers is not being novel; she is simply saying what the apostle Paul penned to the first century local church at Colossae: “Whatever you do, work heartily, as for the Lord and not for men, knowing that from the Lord you will receive the inheritance as your reward. You are serving the Lord Christ” (Col. 3:23–24). Though our work may be difficult and at times exasperating, we do not have to hate our work or merely live for the weekends. We need to rethink how we think about our work. When we begin to embrace how work ought to be, then we begin to see what we do each and every day as an integral part of our worship of God. If you understand that God designed you to contribute to his creation, you will take seriously how and where you are called to make your important contribution in the world. When we thoughtfully reflect on God’s original design for our work, we are inspired with its beauty and grandeur, but we also realize that work and the workplaces we inhabit in our present world are not as God designed them to be. You may be thinking, Tom, this reflection on God’s design for our work all sounds well and good, but you don’t know the difficulty of my work or the pressures of my workplace or what a difficult boss I work for! And you are right in the sense that I don’t know all that you are facing in this competitive, fast-paced world. I may not know the particularities of your work, but over the years I have interacted with many people about their work, and I do know that for each one of us who desires to connect our Sunday faith with our Monday work, the ongoing challenges are ever present and significant. I must confess I am an enthusiastic fan of the television show The Office. Each week the Dunder Mifflin gang makes their way into our living room. The Scranton division of a fictitious paper company by the name of Dunder Mifflin and the cast of characters have become a lasting fixture in our imaginations. The Office, at first glance, gives a humorous depiction of work and workplace antics, but the more you enter into the lives of these characters and the workplace they inhabit, the more painfully broken it seems. On display every week for the entire world to see is the ongoing drama of very broken individuals who daily bump into each other in the workplace. Though the writers of The Office sometimes go over the edge for my tastes, each week they remind a watching world that work is an important part of what it means to be human. The Office says to us that we were created to work, yet unresolved tensions fill the air of every episode, and we are left to ponder that work now is not what it really ought to be. Daily we are confronted by a sobering reality that our work, the workers we work with, and the workplaces in which we work are not as God originally designed them. In a myriad of ways we are painfully reminded each and every day that we live and work in a fallen and corrupted world. Like many other things in life, work in this less-than-perfect world is a mixed bag. This is the inescapable reality to which we will turn our attention next. How does knowing that you are created in the image of a God who works change the way you view work? In what ways does your work serve to create and cultivate culture? What would change in your work if you maintained the mindset that you live and work before an Audience of One? How might you do your work as a God-honoring act of worship? Dr. Tom Nelson (DMin, Trinity Evangelical Divinity School) has served as senior pastor of Christ Community Church in Leawood, Kansas, for more than twenty years. He is the author of Five Smooth Stones and Ekklesia as well as a member of The Gospel Coalition. 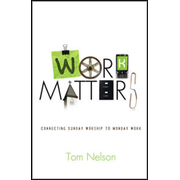 The article above was adapted from Chapter One his fabulous theology on work entitled: Work Matters. Wheaton: Crossway Books, 2011.